The mouse is heading to the great mousemat in the sky. Will you miss it? This week's news isn't nice for mice: Microsoft's purchase of multitouch firm Perceptive Pixel is yet more evidence that the era of the mouse is coming to an end. When the mouse finally dies, it'll be a hell of a whodunnit: instead of a single gunshot and a smoking gun, the victim will have been shot, stabbed, burned, minced, microwaved, irradiated, poisoned, drowned and asphyxiated by a cast of thousands. It'd make the world's worst game of Cluedo: was it Mrs Siri, in the kitchen, with a smartphone? Doctor Google, in the garden, with Google Now? Colonel Kinect, in the living room, with his waggly fingers of fun? It was all of them, and more. You've heard of whack-a-mole. The tech industry's playing whack-a-mouse. One of the reasons the mouse has hung around for so long is because its natural habitat is the desk. 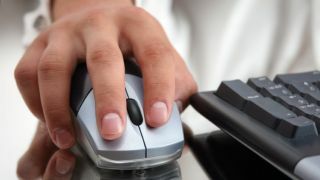 Once you've got the hang of the mouse - something that's a huge hurdle for many beginners - the alternatives are awkward, expensive or both, especially when you reach the level of unconscious competence where your mouse hand just moves without your having to think about it. Compared to the familiar keyboard and mouse combination, desktop voice recognition is slow and requires a different way of working, huge touchscreens cost too much and give you Gorilla Arm, trackpads aren't as detailed, console-style controllers aren't accurate or fast enough and so on. These days, though, we're not always tied to our desks. For example, Kinect offers a very different kind of control to the traditional WASD and mice of first person shooters, and nobody lounging on their sofa with a tablet is thinking "man, I wish I was trying to control this with a mouse on my knee". The big change, of course, is mobile. For mice, mobile's a hostile environment - not just because any self-respecting smartphone or tablet does multi-touch, but because other technology, such as location awareness and voice recognition, is much better suited to pocket computers. The mouse is still with us, of course, but that's partly because we still have desktop OSes where the mouse is expected - and that's changing, as both OS X Mountain Lion and Windows 8 demonstrate. As Apple, Microsoft and others continue to blur the lines between mobile and desktop computing, embracing everything from collaborative multi-touch to voice and gesture control, the mouse is going to appear increasingly anachronistic. It's not going to disappear altogether - good luck persuading a Photoshop whiz to swap the precision of their mouse for fat-fingered fumbling on a sheet of glass - or any time soon, because while the alternatives are good some of them are still in their early days - but we're seeing the slow decline of the familiar WIMP (Windows, Icons, Mice and Pointers) interface that's served us so well for so long. My heart will miss it, but my hurting hands won't.